You can easily lock Windows 10 in quite a number of ways. Though not hard, locking Windows 10 computer is still a manual action. If you want to, you can configure Windows 10 to lock automatically after inactivity. You can specify the inactivity time like ten minutes, fifteen minutes, etc. If you frequently find yourself moving away from your computer then locking Windows automatically is quite useful and secure too. So, let me show you how. The easiest way to make Windows 10 lock itself automatically on inactivity is to use the Group Policy editor. In the editor, you change a single policy and you are done. Do keep in mind that this method only works on pro and enterprise versions of Windows 10. If you are using Windows 10 home version then follow the second method. i.e, registry method. 1. First, search for "gpedit.msc" in the start menu and click on it. This action will open the Group Policy editor. 2. Once the group policy editor has been opened, you will see different folders on the left panel. Go to the following location in the group policy editor. 3. On the right panel, find the "Interactive Logon: Machine inactivity limit" policy and double-click on it. 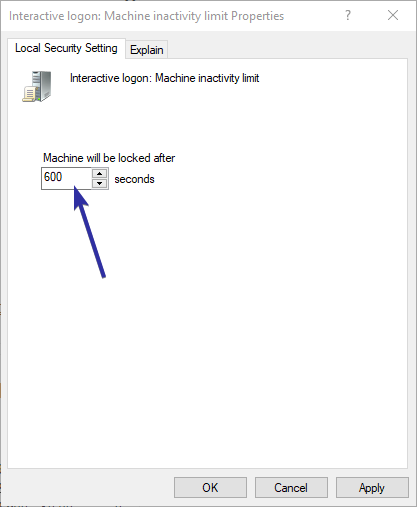 This is that policy that allows setting the Windows 10 automatic lock after some time of inactivity. 4. 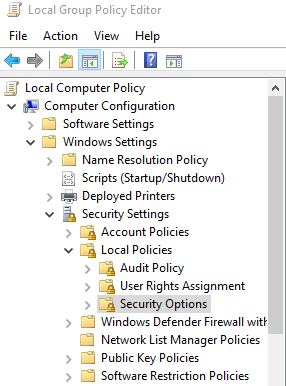 In the policy properties window, enter the number of seconds after which you want Windows 10 PC to lock automatically. Choose the number of seconds between 1 and 599940. Click on the "Apply" and "Ok" buttons to save the changes. In my case, I want my PC lock itself after 10 minutes, so I entered 600 in the blank field. 5. Even though the policy is changed, it is not yet applied. 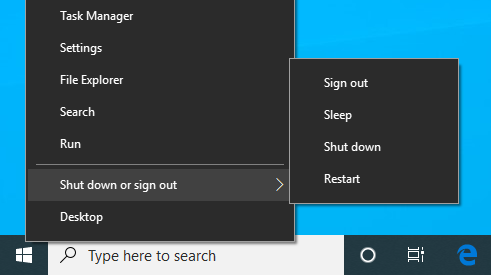 To apply the policy, right-click on the start menu and select "Shut down or sign out -> Restart". After restarting, the policy will be applied and your PC will now automatically lock after the specified inactivity time. If you ever want to disable automatic Windows 10 lock, just set the seconds value to 0 or empty in step 4 and save the changes. If you are using Windows 10 home version, then you need to use the registry editor to automatically lock the computer. All you have to do is create a single value. Though editing registry for this specific purpose is nothing hard, I'd recommend you to backup the registry. The backup allows you to restore the registry if anything bad happens. 1. 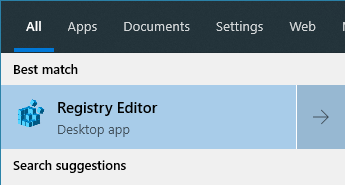 First, open the start menu, search for Registry Editor and press the enter button to open it. 2. In the registry editor, copy the below path, paste it in the editor's address bar and press Enter. You will be instantly taken to the folder where you need to add the new value. 3. We now need to create a new DWORD value. So, make sure the System folder is selected in the left panel. 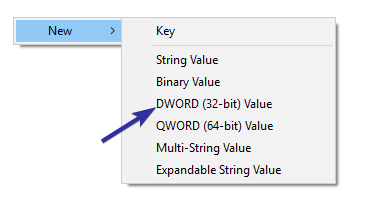 Next, right-click on the right panel and select "New -> DWORD (32-bit) Value" option. 4. Name the new DWORD value as "InactivityTimeoutSecs" and press Enter to confirm the name. 5. 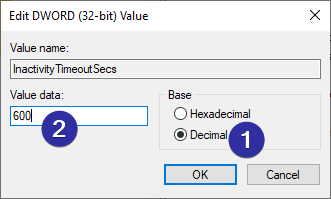 After creating the DWORD value, double-click on the value. In the Edit Value window, select the "Decimal" radio option and enter the number of seconds in the blank field. Make sure that the number is seconds are between 1 and 599940. In my case, I'm entering 600 for 10 minutes. Click on the "Ok" button to save the changes. 6. This is how it looks like in the registry editor after setting up the value. 7. To apply the changes we just made, reboot your system. After rebooting, your computer will automatically lock after inactivity. If you want to disable the automatic lock feature, all you have to do is enter 0 in step 5 or delete the InactivityTimeoutSecs DWORD value. That is all. It is that simple to configure Windows 10 to automatically lock itself after inactivity. If you like this article, do check out how to resize images from right-click menu and how to change default computer name in Windows 10.